I’ve read this back and what follows is demonstrably an old guy’s opinion of a young person’s film. Still, if the glove fits. Okay, here we go. Divergent means ‘to be different or develop in different directions’ so I’m afraid it doesn’t really apply to this film. It looks like it has come from exactly the same ‘teen dystopian future drama’ generator as The Hunger Games. Take one young heroine who is naturally reserved but can be feisty when the situation demands it. Place her amongst those who live the simple life in a post war future. Insert one oppressive government regime for her to reluctantly stand up to. Add an artificially created environment that will place her in the midst of her worst nightmare. Throw in a love interest and watch the money roll in. Harry Potter led to a series of other big budget films centred around magic and monsters; Percy Jackson, The Sorcerer’s Apprentice, The Golden Compass, The Mortal Instruments and even to some extent Twilight. Now, clearly, it is Katniss Everdeen’s turn to lead the pack. Divergent is perfectly fine but there is no escaping the fact that, in every respect, it just isn’t as good as The Hunger Games. The action isn’t as exciting, the older supporting cast are not as A-List and, good as she is, Shailene Woodly is no Jennifer Lawrence. Actually let’s pick up on those last two points. With regard to the adults in the film, we have Kate Winslet but the next biggest name is Ashley Judd. The Hunger Games obviously had Donald Sutherland and Woody Harrelson and then Philip Seymour Hoffman. Divergent may well pick up some bigger names for the sequel but at the moment we get Tony Goldwyn, best known for getting glassed in Ghost, and Mekhi Phifer, who was in ER for a bit. Incidentally, watching Winslet just made me aware of my own advancing years. You know you are getting on when the teen heroes of your youth are now playing the evil matriarchs. Also, there was once a time when Winslet would improve any film 45% just by being in it (Titanic could actually have sunk without her) but she doesn’t add much here. What of the star of the show then, 22 year old Shailene Woodly? (Sit tight kids, you’ll be watching her as an ageing mother figure before you know it.) Woodly may be no Jennifer Lawrence but to be fair neither was Jennifer Lawrence when she made the first Hunger Games movie. She had shone in Winter’s Bone but didn’t properly set the world alight until Silver Linings Playbook. Similarly Woodly was very good with George Clooney in The Descendants and looks set to move on to bigger things. She is good in this film and easily carries the movie. The comparisons are unavoidable but taken on its own merits Divergent is a perfectly fine film (whoa, let’s not go overboard with the hyperbole). In the future it seems that everywhere apart from Chicago has been destroyed and the small group of remaining people have divided themselves into social classes apparently based on high school cliques. There are Abnegation (teacher’s pets), Dauntless (the jocks) Erudite (the nerds), Candor. (the dweebs) and Amity (the hippies). Some people are divergent though and they can’t be controlled so need to be hunted down and killed. Not killed straight away though, there clearly needs to be a chance for them to escape. I don’t think you need more plot than that, I’m pretty sure you can work it out from there. Anyway, my 12 year daughter liked it and it is her it is aimed at. A solid 3 out of 3. Woodly’s Triss is genuinely a good role model for young people. Divergent may be derivative of other series of book-to-film adaptations but the more strong young girls with resourcefulness and integrity we get on our screens, the better. 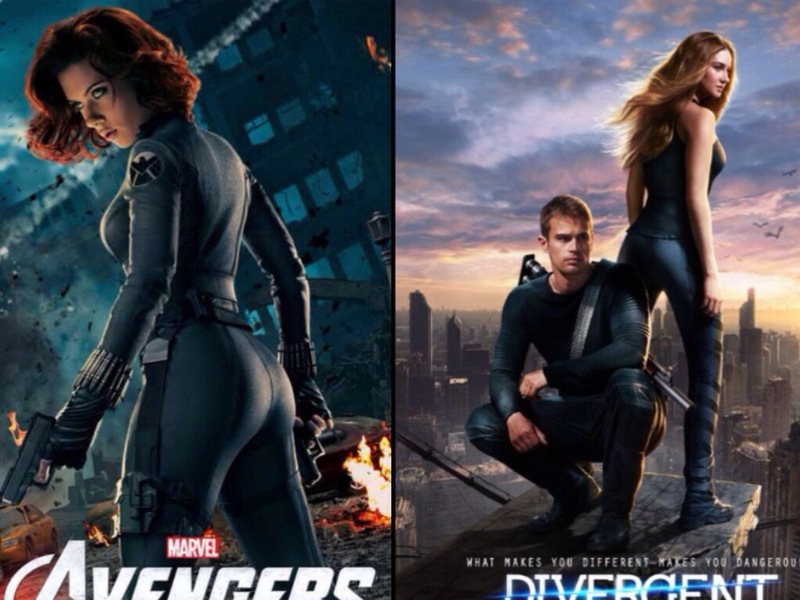 More the shame then that the publicity went the way of that awful Scarlett Johansson Avengers poster and has her with her back to camera so as to show us her shapely behind. Lots of people get shot, a few people get stabbed, everyone seems to get punched and kicked. There are some bloodied noses and bruises but none of it is that bad for the teenage audience it is intended for. There is some smooching too but nothing you’d be embarrassed to watch with your parents. It tries to be different from the other young adult genre films out there, but it just isn’t. Some interesting things happen here and there, but nothing too much. Good review. Thank you. It is inevitable once something becomes successful that other films will follow in the same mould but it does mean there is less originality. My last post on the current trend to have established characters teaming up in stories picks up on this same thing.